With Acting on Dreams, curator Yaelle Amir explores the work of artists who use creative, often process-oriented, strategies and community collaborations to advocate for authorized and undocumented immigrants and propose innovative alternatives to immigration reform. Exhibiting artists are: Andrea Bowers, CultureStrike & JustSeeds, Chitra Ganesh and Mariam Ghani, Ghana ThinkTank, Marisa Morán Jahn (Studio REV-) in collaboration with National Domestic Workers Alliance and Caring Across Generations, Jenny Polak, QUEEROCRACY in collaboration with Carlos Motta, and Favianna Rodriguez. Immigrants now comprise approximately 13 percent of the total U.S. population (41.3 million), of which over a fourth are undocumented (11.4 million) and close to a fifth live in poverty. Despite numerous roadblocks, many in the United States have called for an overhaul of the immigration system, seeing it as a necessary and crucial step in the development of a more humane and just American society. Yet many others still fail to acknowledge immigrant hardships or to empathize with their conditions, prompting individuals, such as community activists and artists like those in Acting on Dreams, to attempt to fill the enormous gaps in immigration services and knowledge. With a recent surge in border crossings on the one hand, and stalled legislation in Congress and increased deportations on the other—the work of community and grassroots groups to raise awareness and ease immigrant living conditions has become more essential. The works included in this exhibition chronicle several efforts of immigrants and their advocates, while drawing connections between various communities and concerns within this highly complex issue. 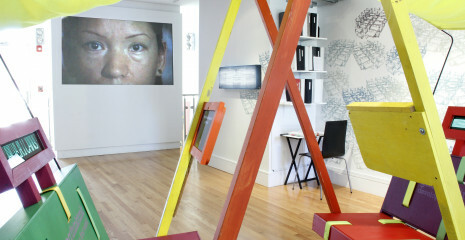 The artists apply their creative skills to further compassionate and respectful policies, and strive to communicate the immigrant experience in the United States—the frequent sense of isolation and uncertainty, but also courageousness, pride, and anticipation.The projects presented in Acting On Dreams include installation, sculpture, and video. Together, these artists present informed perspectives on U.S. immigration today via strategies such as research, storytelling and activism. In her video Sanctuary, Andrea Bowers tells the story of Elvira Arellano, an undocumented immigrant who entered into sanctuary on August 15, 2006, at the Adalberto United Methodist Church in Chicago in order to avoid the prospect of deportation and separation from her 8-year old son, a U.S. citizen. Arellano was ultimately deported a year into her stay at the church, and continues to organize from Mexico. The work attaches a face to the ruthless federal deportation policies that often go overlooked and reinforced in the discussions of policy reform. The Index of the Disappeared is an evolving multidisciplinary, physical archive and platform for public dialogue that embodies a haunting chapter in U.S. history. Artists Chitra Ganesh and Mariam Ghani have worked to compile an archive around post-9/11 disappearances to highlight the uncertainty many immigrants have experienced as a result of the geopolitical and policy shifts in the U.S. since 2001. Through official documents, secondary literature, and personal narratives, Index traces the ways in which censorship and data blackouts have enabled unprecedented disappearances, deportations, renditions, and detentions in the lives of immigrant, “other,” and dissenting communities in the U.S. A portion of the archive is included in the exhibition with a purpose of confronting audiences with the human costs of public policies, connecting domestic and foreign policies and policing, and challenging viewers to reevaluate the abstractions of political rhetoric in individual terms. In ThinkTank at the Border, Ghana ThinkTank has developed a multi-year project in an effort to investigate the seemingly un-crossable divide between “opposing” sides of immigration-related issues, collecting problems from citizen border-patrols like the Minutemen, and bringing them to recently deported or undocumented immigrants to solve. They collect these problems through focus groups, street interviews, and postcards, and present the immigrants’ solutions back to the Minuteman-like groups, working to find ways to have them implemented. The exhibition presents an iteration of the project, Border Cart – a mobile cart designed to fold into the back of a Tijuana Taxi, and then unfold at the border to provide shade, a seat, and a public think tank process to people crossing the U.S. – Mexico Border. Their border project is an outgrowth of a longer term project initiated in 2006 to “Develop the First World” by sending problems from the so-called “first” world to think tanks in Cuba, Ghana, Iran, Mexico, El Salvador, and the U.S. prison system to be solved.In an ongoing body of work entitled “CareForce,” artist Marisa Morán Jahn (Studio REV-) in collaboration with the National Domestic Workers Alliance and Caring Across Generations uses an artistic framework to develop tools that assist domestic workers in learning their rights and advocating for their socio-economic justice. Bridging public art, law, tech, and design, their projects have taken on various forms. From a mobile design lab and sound studio, to dance and movement, to an informative app accessible by any kind of phone—they offer crucial support to those who take care of our children, family, and homes. Jenny Polak has worked with residents and immigrant activists in Illinois and Indiana to advance recent struggles in blocking the construction of for-profit immigrant detention centers in their midst. Polak maintains an ongoing relationship with key figures in these communities—collaboratively developing imagery to create custom domestic objects that raise awareness to the effects of detention centers on jailed immigrants and on their surrounding communities. The photographs, drawings, and figurines that comprise (n)IMBY also assist the campaigners in documenting their achievements so that others can refer to them as a model. On Columbus Day in 2011, Queerocracy in collaboration with the artist Carlos Motta organized the distribution and collective public reading of excerpts from A Timeline of Queer Immigration – an exhaustive list of significant events in the global queer and immigrant movements. The intervention took place at Columbus Circle, the site commemorating the individual who marked the official start of immigration to Northern America. The timeline begins with Columbus’ arrival in 1492 and continues with dozens of seminal events that highlight the parallel struggles of immigrants and queer individuals to be recognized as equal citizens. Artist Favianna Rodriguez co-founded CultureStrike, a grassroots arts organization that engages cultural producers in migrant rights. Her work stems from the belief that art is necessary in promoting awareness of the disastrous effects of U.S. immigration policies, and in countering the often-negative perception of immigrants. As part of these efforts, Rodriguez initiated the campaign Migration is Beautiful featuring the now-iconic monarch butterfly symbol. The exhibition includes a coloring station by Rodriguez that provides advocates with on-site tools to construct their own butterfly wings in a public display of support for immigrant rights, as well as Migration Now!, a comprehensive print portfolio by CultureStrike and JustSeeds. This exhibition was sponsored, in part, by Connecticut Department of Economic and Community Development Office of the Arts. Andrea Bowers, CultureStrike & JustSeeds, Chitra Ganesh and Mariam Ghani, Ghana ThinkTank, Marisa Morán Jahn (Studio REV-) in collaboration with National Domestic Workers Alliance and Caring Across Generations, Jenny Polak, QUEEROCRACY in collaboration with Carlos Motta, and Favianna Rodriguez.